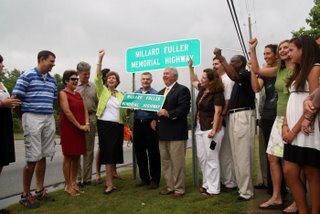 Millard Fuller Memorial Highway — Unveiled! Georgia State Representative Randy Nix, Alabama State Representative Duwayne Bridges and Lanett, Alabama Mayor Oscar Crawley joined together Saturday, August 14th, 2010 to unveil a new sign naming a portion of U.S. Highway 29 the Millard Fuller Memorial Highway (MFMH). The naming of the road is intended to honor Millard’s tireless work toward eradicating poverty housing. In 1976 he founded Habitat for Humanity. After leading the organization as its president for 29 years and overseeing the housing of more than one million people around the world, he and his wife Linda went on to start The Fuller Center for Housing in 2005. “I think it’s about the most incredible way they could have honored one of their native sons,” said Linda Fuller. Millard grew up in Lanett, Ala., and later made his home in Americus, Ga., after starting Habitat for Humanity International. Millard passed away unexpectedly in February 2009 at the age of 74. 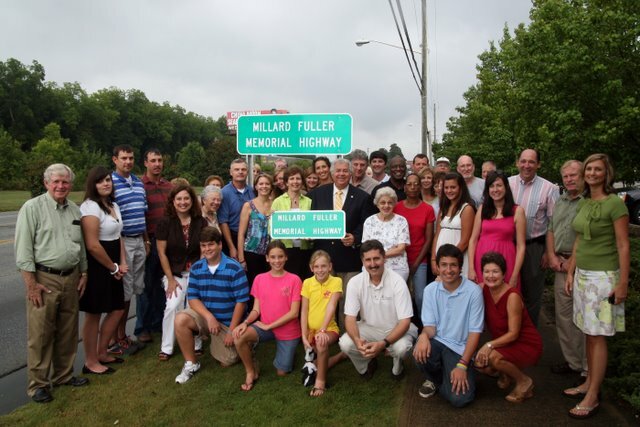 The Millard Fuller Memorial Highway stretches approximately 22 miles from LaGrange, Georgia to Valley, Alabama. (10.6 miles through Alabama, 12 miles through Georgia) The route runs west from Lagrange at Lees Crossing which, at that point, turns south and becomes West Point Road. Continuing, US 29 passes to the east of West Point Lake until it comes to the adjoining cities of West Point, Lanett and Valley, Ala.
Interestingly, MFMH is the final section of the Roosevelt Parkway which stretches more than 100 miles from Atlanta to West Point. And, the entire length of US 29 covers more than 1000 miles from Washington, DC to Pensacola, FL, loosely weaving its way alongside I-85 and I-65. 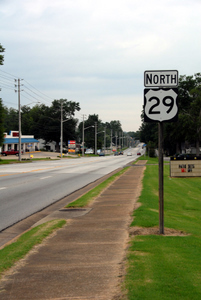 In other words, US 29 was one of first north/south routes from our nation’s capitol to the Florida coastline. Gretchen (Susan) Ferguson of Lagrange, GA originally conceived of the idea and initiated time-consuming efforts with community leaders and both Alabama and Georgia legislatures in establishing a visible and appropriate memorial in Millard’ boyhood home. Alabama State Representatives Duwayne Bridges and Richard Laird, and Georgia State Representatives Randy Nix helped get legislation passed in their states to name the highway for Mr. Fuller. State of Alabama – House of Representatives, Montgomery, Ala.
NAMING U.S. HIGHWAY 29 IN CHAMBERS COUNTY "THE MILLARD FULLER MEMORIAL HIGHWAY"
BE IT RESOLVED BY THE LEGISLATURE OF ALABAMA, BOTH HOUSES THEREOF CONCURRING, That U.S. Highway 29 commencing at the Georgia state line and continuing to the Chambers County line is named "The Millard Fuller Memorial Highway." BE IT FURTHER RESOLVED, That the appropriate officials are requested to place and maintain signs or markers as provided in this resolution. IN WITNESS WHEREOF, I have hereunto set my hand and have caused the GREAT SEAL of the State of Alabama to be affixed by the Secretary of State at the Capitol in the City of Montgomery on this the 8th day of February, 2010. Above photo: Linda Fuller, center holding sign with Rep. Duwayne Bridges, is surrounded by family, friends and supporters at Saturday’s history-making event in West Point, Georgia. Learn more and watch a video about Millard Fuller.